On June 12, 2012, in this newspaper, we posed the question: “Honey and Genetically-Modified Organisms: An Impossible Coexistence?” At that time, the concern was about the contamination of honey by pollen from genetically modified soya beans, a crop that had just been authorized for large-scale planting in Mexico. Today we can assert with much scientific evidence that coexistence is impossible: honey production will be irremediably and negatively affected by cultivation of GM soya beans. This assertion is supported by scientific, environmental and social arguments. From the scientific point of view, it has been shown that contamination of honey with pollen from GM soya beans is inevitable. Based on the research itself, we know that the bees visit soya bean fields up to two kilometres from their hives. 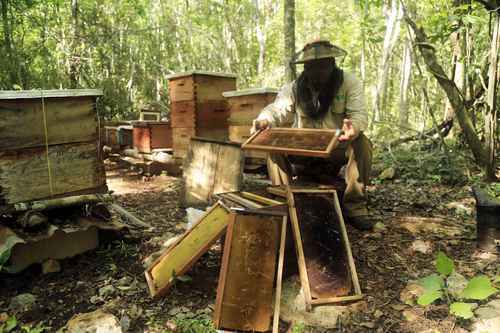 There have been no serious cases of pollution of Mexican honey until now, because soya is still cultivated in limited extensions (up to 16,000 hectares in Hopelchén, Campeche), and the bees still rely on other non-GM crops. But by expanding the areas planted with GMOs or extending the planting in approved sites, eventually what happened in Argentina will occur here. In Argentina, 28-percent of honey contains GM pollen. Therefore, it is not possible for honey cultivation to coexist with the planting of GM crops without GM contamination. From an environmental point of view, the most serious is that the soya bean monoculture is grown on recently deforested land, without permission to do so, and it involves the use of glyphosate with undesirable short, medium and long-term effects. Data from SAGARPA [Secretariat of Agriculture, Livestock, Rural Development, Fisheries and Food] shows that between 2013 (the year after permits were issued for GM Soya bean) and 2014, the agricultural area increased to 9,594 hectares, and the soya bean area has increased to 9,449 hectares, quickly making up 24.7-percent of the cultivated area in this vast Municipality of Hopelchén. Not only does the extension of soya bean cultivation coincide with the expansion of agriculture, but these extensions are taking place at the expense of original vegetation due to the immoderate, illegal logging of the forest. Losing forest area means the loss of a crucial resource for the bees. This loss affects both the production of honey and the bees’ diversity. [But it also affects] the biodiversity that is one of Mexico’s great riches and the basis for equilibrium in this agro-ecological system and many other systems. Finally, there are other harmful environmental impacts: water runoff [on deforested hillsides], soil loss, and so on. The use of glyphosate in all the fields approved for GM-soya bean and others on offer today implies very negative impacts on the environment and health. Soya beans tolerant to this pesticide accumulate it in their tissues and it gets into food and also in to the pollen that, by contaminating the honey, also arrives in our diet. The World Health Organization has classified glyphosate as probably carcinogenic in humans. By planting any GM crop resistant to this pesticide, its concentration is increased in food, water, and other implements for common and close use (e.g., cotton, among others). In Argentina it has been shown that exposure to glyphosate seriously affects learning and also the health of the bees. In short, the cultivation of GM soybean implies adverse impacts not only on the health of bees and humans, but on the environment as well. The planting of GM Soybeans also has negative impacts on society. Their monoculture requires large areas, encouraging the concentration and dispossession of land. A prime example of this process was the purchase in 2008 of 5,695 hectares in the ejido of Xmaben, also in the Municipality of Hopelchén. In this way the territories and communities are being broken up at the expense of the agribusiness fields which only want to increase the scale of their businesses and obtain greater profits. 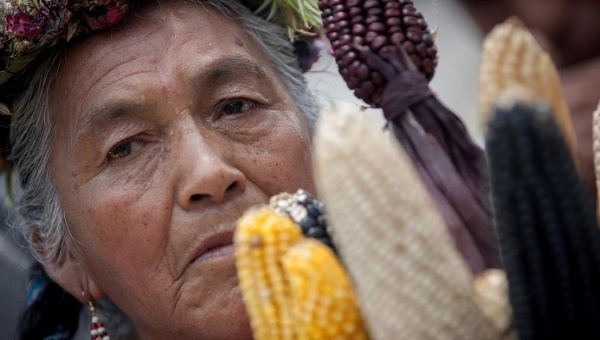 This also undermines the sovereignty of the pueblos, their independence and their ability to produce their own food. In short, after three years of careful studies and rigorous scientific analysis, we can say, without any doubt, that it is not possible for the planting of GM soya beans to take place alongside the production of honey without GM contamination and carcinogenic pesticide contamination. In addition, the planting of these GMOs leads to high rates of deforestation, harm to the health of bees, farmers and consumers, and negative environmental impacts one after another. 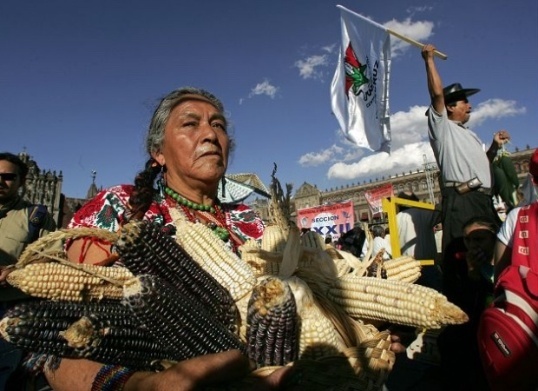 Planting GMOs abolishes food sovereignty, promotes land grabbing and dispossession, and the disintegration of territories and peasant communities, with all the negative social consequences and injustice that this implies. *Rémy Vandame is coordinator of Apiculture (Beekeeping) in the Program of Agriculture and Food with the Union of Scientists Committed to Society. 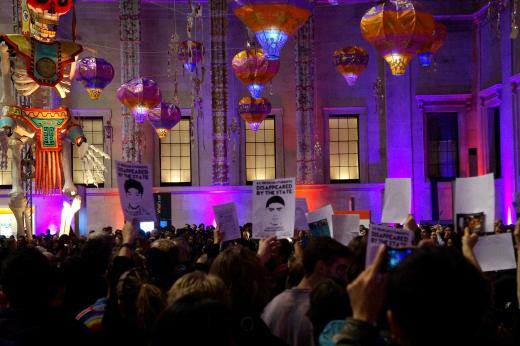 The evening-long protest-performance aimed to embarrass BP as it attempts to sell itself to Mexican officials and the public. 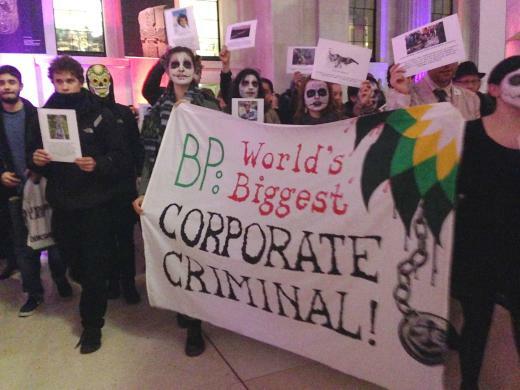 It was co-organised by the London Mexico Solidarity and BP or not BP? and highlighted BP’s environmental destruction, human rights abuses and lobbying against climate action. 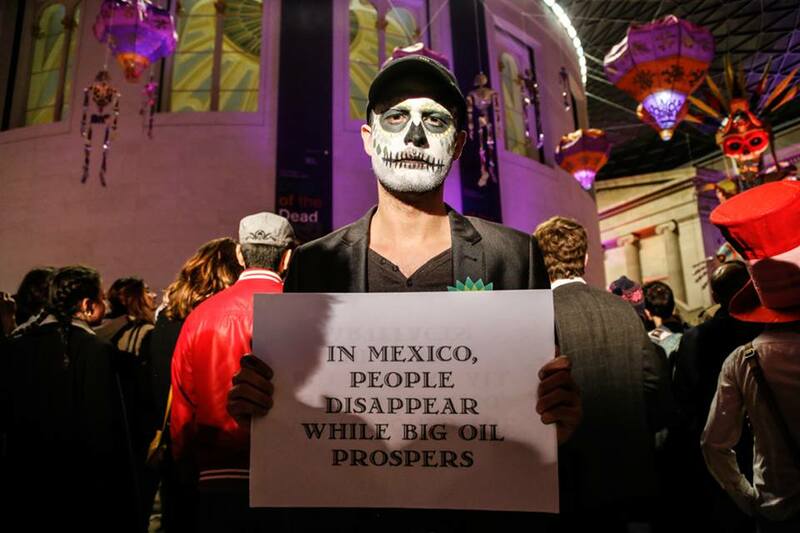 It also accused the Mexican government of trying to distract attention from human rights abuses – including the disappearance a year ago of 43 students – and of co-opting arts and culture to attract foreign investors to its newly-privatised oil and gas sector. 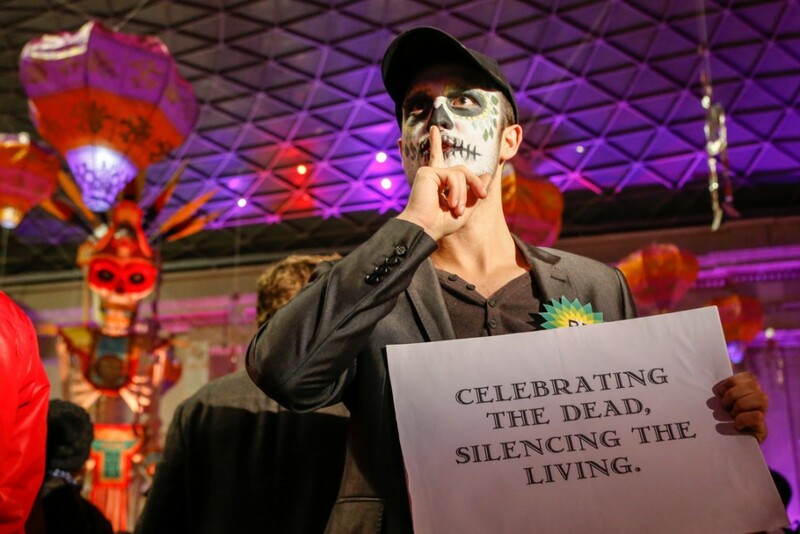 This week, BP and the Mexican government are co-sponsoring a four-day-long Day of the Dead festival at the British Museum. 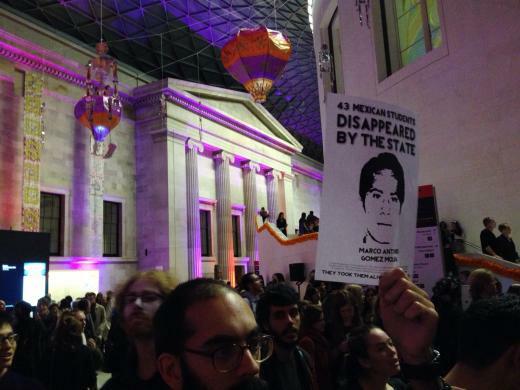 Both are trying to improve their public images by associating themselves with Mexico’s world-famous festival and London’s world-famous museum. But behind the sugar skulls and colourful shrines to the dead there is a much darker tale of greed, corruption, death and pollution. 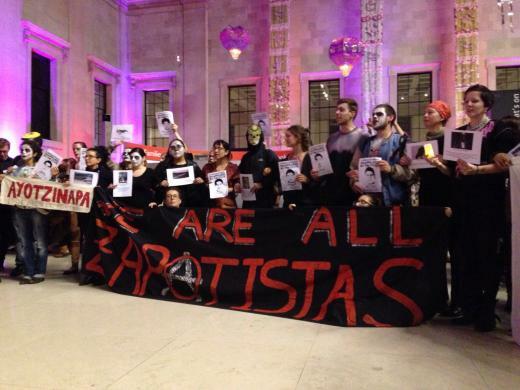 On Friday evening, the London-Mexico Solidarity group and BP or not BP? gatecrashed BP and Mexico’s deadly party to expose the truth. Alberto Villatoro, a farmer in the fertile region of Los Cacaos in Chiapas, Mexico, recalls, with a mixture of sadness and anger, how innocently he used to walk over the area’s silvery blue rocks. 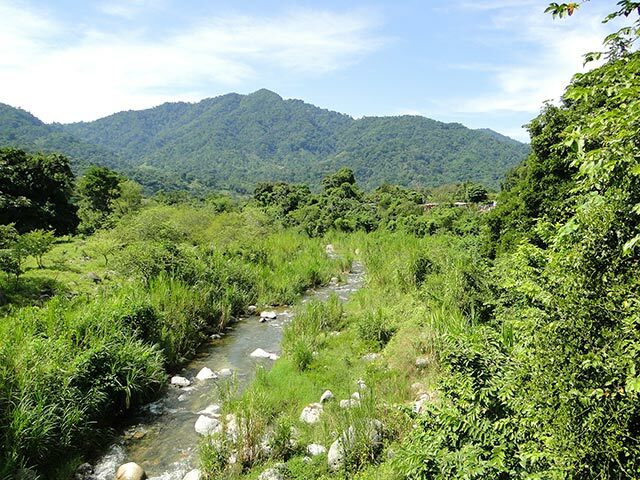 Mexico’s government gave the green light for titanium mining to occur below 500 of the 530 hectares that make up the Los Cacaos community, via underground tunnels stretching from the foothills of the Sierra Madre mountain range up to the upper section of the town. Villatoro and his neighbors in Los Cacaos express acute fears about the potential environmental effects of Honour Up Trading’s plans. “If they build tunnels, the mountain will collapse, because it is a very wet area,” Villatoro told Truthout. He believes that local leaders “were tricked into signing off on the exploration process” by the mining company, he added. Florentina Antonio Morales, a local farmer echoed this allegation. “They came here to trick us, that’s the truth,” she told Truthout. “They promised us a lot. They said they would build a market, a road, a park for the kids. But none of that went any further than just talk.”…….. The push to increase titanium mining in Chiapas is part of a global response to the demand for titanium created by the increasing popularity of laptops and mobile phones, which require titanium to produce. Hans Vestberg, the executive director of Ericsson, predicted in 2012 that by the year 2020 there would be 50 billion mobile phones connected. Manufacturing a single mobile phone requires at least 200 types of metals, including titanium. Titanium is also used in the weapons, aeronautical, naval and nuclear engineering industries and is heavily sought after by the United States, the European Union, Japan and China. Mexico is one of five Latin American countries where the presence of the material has been identified, along with Brazil, Paraguay, Chile and Peru. Mexico’s Finance Ministry maintains that the country could meet a significant part of the world’s demand for titanium, pointing to deposits in the subsoil of Chiapas. According to the Mexican government’s Comprehensive Mining Administration System (SIAM) and Infomex, 99 mining concessions have been granted by the federal government in the state of Chiapas in 2015, with operating licenses that are valid until 2050 and 2060. The peasant land and indigenous territory granted in concessions totals approximately 1,057,081 hectares, the equivalent of 14.2 percent of the state’s area. 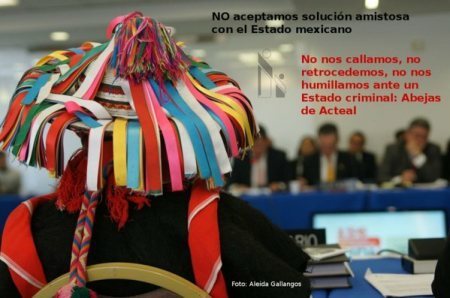 On 12th October, representatives from the indigenous Binni’zaa (Zapotec) community from Juchitán de Zaragoza reported that, due to the legal motion they had submitted against the construction and the operation of the megaproject advanced by the Southern Wind-Energy Corporation on their lands, a judicial order has been made to suspend all the authorizations, permits, approvals, licenses, and land-use changes awarded by local and federal officials. The demand for the motion had been presented by 1,166 Binni’zaa indigenous people, and the suspension was approved on 30 September 2015. “We demand that all the authorities and firms involved in the Southern Wind-Energy project observe with the demand made by the judge to suspend this work, meanwhile we wish to denounce that as a consequence of this judicial resolution, harassment has increased against the people who had advanced the legal motion,” they indicated in a press-conference. Beyond this, they added that “there was no public consultation, given that last January the project had been approved by the Regulatory Commission on Energy and the Environmental and Natural Resources Ministry, but it was not until June of this year that the consultation was carried out. In any case, it was mere simulation.” Beyond this, it was recalled that the Southern Wind-Energy Firm belongs to the same groups of capitalists that in 2012 comprised the Mareña Renewables firm, against which the indigenous had won a different legal motion two years ago. But it has returned now with another name. The young support base Lizbeth and the listener Selena maintain that they didn’t know the life of the haciendas and now they have the freedom and the right as women to express their opinion, discuss, participate in the multiple tasks of the resistance and autonomy, resisting the counterinsurgency and the mirages of capitalism that they show on television, trying to use cell phones and the very same television for their struggle. They distinguish the poor-poor, the party members, materially poor and poor of thought, from the Zapatistas, who are also poor but rich because of their work for the good of the people and so that there are no dominators or exploiters. For his part, Sub Galeano, in his “Vision of the conquered,” points out how those generations of Indigenous women now say their word in the genealogy of their struggle. “Three generations of rebel Zapatistas –he emphasizes–, not only against the system, also against us… Zapatista men.” He declares defeat because of that struggle, although like the capitalist hydra he maintains that the males always try to regain their lost privileges. He again takes up the origin of that struggle and describes that everything started with the insurgents. He reiterates that non-indigenous women also participate in the EZLN, and in the main part of his unique narrative-testimony the various opinions of these compañeras are transcribed, which refer to the very intimate man-woman relationship and to the characterization of the dominant and violent male, a schizophrenic hunter who, however sensitive and receptive he may consider himself, cannot be a feminist, because he represents the same system against which he supposedly struggles. 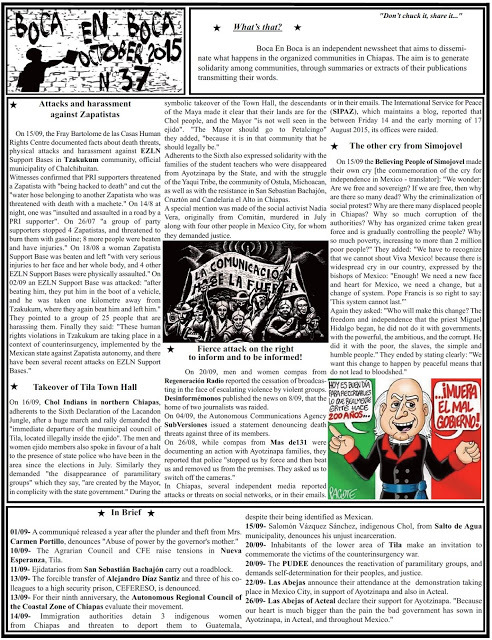 The three parts of the notes on resistances and rebellions, presented by Subcomandante Insurgente Moisés, constitute key texts for understanding the Zapatista struggle. He begins by remembering that the Zapatistas are an armed organization, but contrary to the militarist tradition of some Latin American guerrillas, in this case guns don’t become a fetish, rather they are seen as one more tool, like the machete, the axe, the shovel, although one is conscious that each tool has its function, and the purpose of the gun is to kill. After the ’94 withdrawal, it was understood that the struggle could take many forms and that resistance and rebellion could be expressed in various ways. “Resistance is becoming strong, tough, responding to everything, to any attacks from the enemy, from the system; and rebellion is being brave to take actions, or whatever we must do… One must resist the provocations of the Army and the police, the media reports and the psychological bombardments.” They discovered that with resistance and rebellion it is possible to govern and develop initiatives. 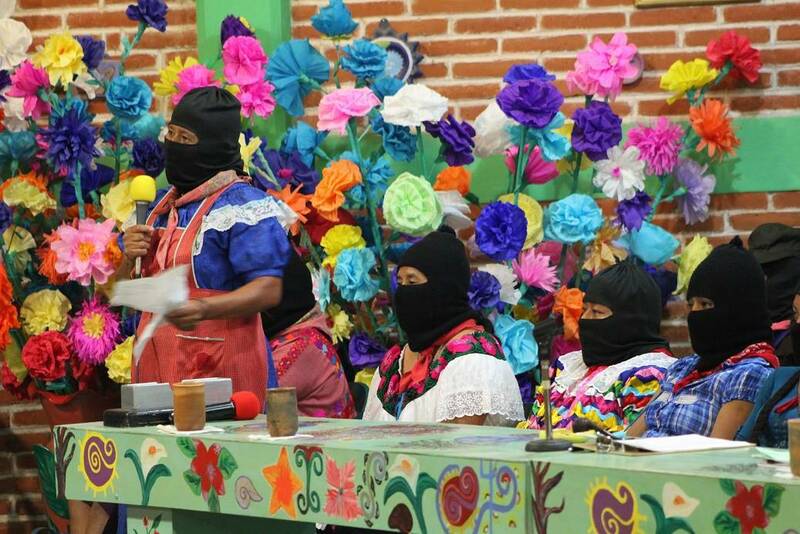 In fact, the Zapatistas have not carried out a single armed attack since January 1994. “It doesn’t mean, compañeros and compañeras, brothers and sisters, it doesn’t mean that we are renouncing our arms, but rather that it’s that political, ideological, rebel understanding, which gives us the way to see how one must really convert this resistance into an arm of struggle.” Political work and explanation are required for all this, and that governing is not conducted with orders, but rather with agreements. Milicianas – Female political organizers with military training that can be called up in an emergency, somewhat like a national guard. 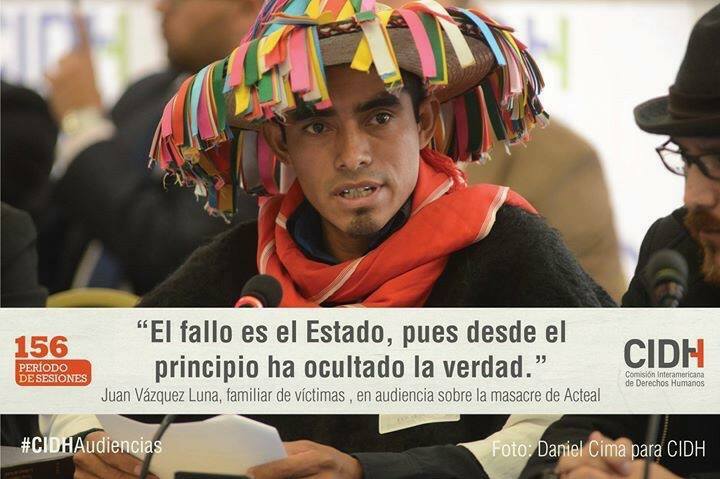 Adherents to the Sixth also expressed solidarity with the families of the student teachers who were disappeared from Ayotzinapa by the State, and with the struggle of the Yaqui Tribe, the community of Ostula, Michoacan, as well as with the resistance in San Sebastian Bachajón, Cruztón and Candelaria el Alto in Chiapas. 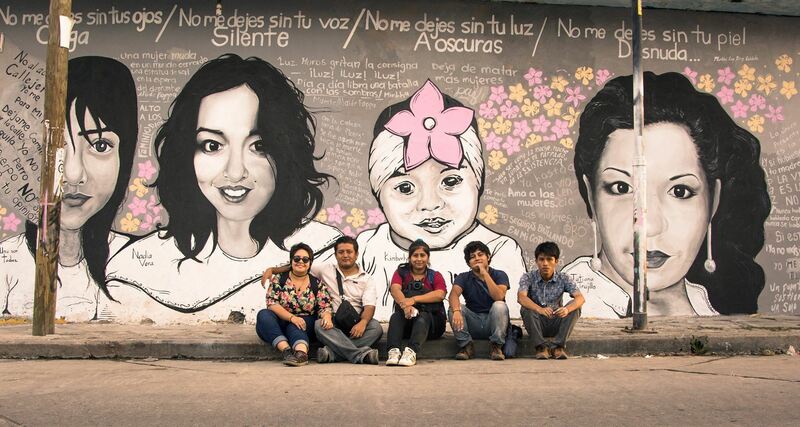 A special mention was made of the social activist Nadia Vera, originally from Comitán, murdered in July along with four other people in Mexico City, for whom they demanded justice. 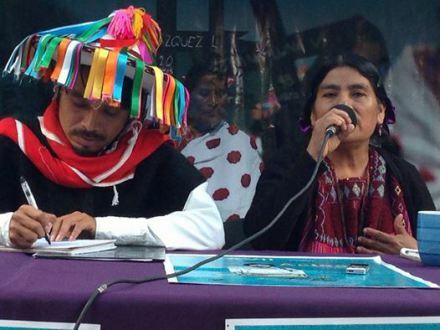 On 15/09, the Fray Bartolome de las Casas Human Rights Centre documented facts about death threats, physical attacks and harassment against EZLN Support Bases in Tzakukum community, official municipality of Chalchihuitan. Fierce attack on the right to inform and to be informed! 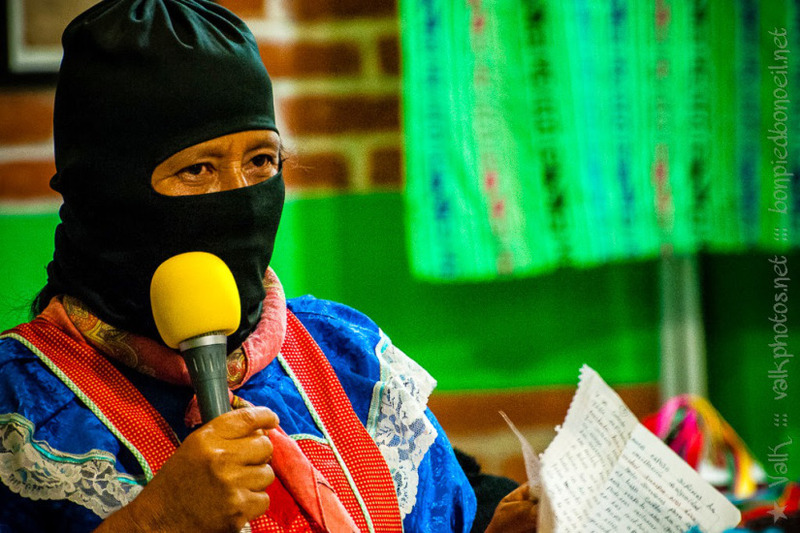 On 20/09, men and women compas from Regeneración Radio reported the cessation of broadcasting in the face of escalating violence by violent groups. Desinformémonos published the news on 8/09, that the home of two journalists was raided. On 04/09, the Autonomous Communications Agency SubVersiones issued a statement denouncing death threats against three of its members. 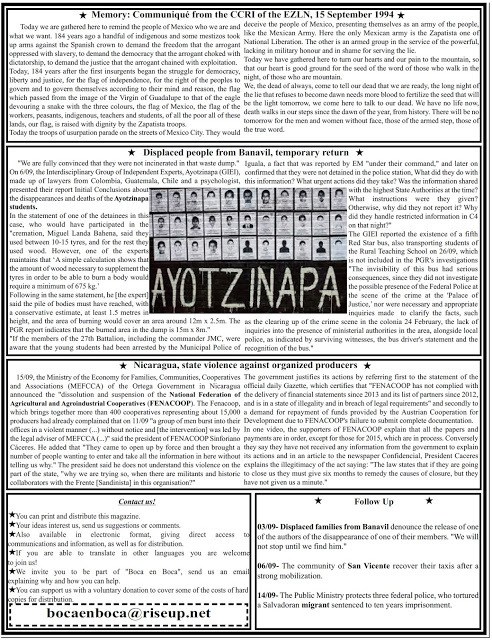 In Chiapas, several independent media reported attacks or threats on social networks, or in their emails. The International Service for Peace (SIPAZ), which maintains a blog, reported that between Friday 14 and the early morning of 17 August 2015, its offices were raided. 20/09- The PUDEE denounces the reactivation of paramilitary groups, and demands self-determination for their peoples, and justice. Today we are gathered here to remind the people of Mexico who we are and what we want. 184 years ago a handful of indigenous and some mestizos took up arms against the Spanish crown to demand the freedom that the arrogant oppressed with slavery, to demand the democracy that the arrogant choked with dictatorship, to demand the justice that the arrogant chained with exploitation. Today, 184 years after the first insurgents began the struggle for democracy, liberty and justice, for the flag of independence, for the right of the peoples to govern and to govern themselves according to their mind and reason, the flag which passed from the image of the Virgin of Guadalupe to that of the eagle devouring a snake with the three colours, the flag of Mexico, the flag of the workers, peasants, indigenous, teachers and students, of all the poor all of these lands, our flag, is raised with dignity by the Zapatista troops. Today the troops of usurpation parade on the streets of Mexico City. They would deceive the people of Mexico, presenting themselves as an army of the people, like the Mexican Army. Here the only Mexican army is the Zapatista one of National Liberation. The other is an armed group in the service of the powerful, lacking in military honour and in shame for serving the lie. Today we have gathered here to turn our hearts and our pain to the mountain, so that our heart is good ground for the seed of the word of those who walk in the night, of those who are mountain. We, the dead of always, come to tell our dead that we are ready, the long night of the lie that refuses to become dawn needs more blood to fertilize the seed that will be the light tomorrow, we come here to talk to our dead. We have no life now, death walks in our steps since the dawn of the year, from history. There will be no tomorrow for the men and women without face, those of the armed step, those of the true word. 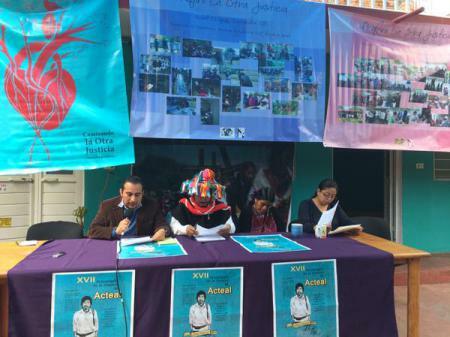 Group of Experts scientifically destroys the Mexican State’s truth about the Ayotzinapa case. 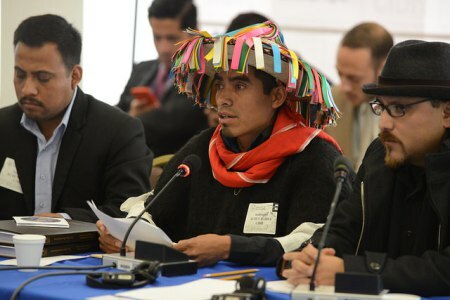 On 6/09, the Interdisciplinary Group of Independent Experts, Ayotzinapa (GIEI), made up of lawyers from Colombia, Guatemala, Chile and a psychologist, presented their report Initial Conclusions about the disappearances and deaths of the Ayotzinapa students. The government justifies its actions by referring first to the statement of the official daily Gazette, which certifies that “FENACOOP has not complied with the delivery of financial statements since 2013 and its list of partners since 2012, and is in a state of illegality and in breach of legal requirements” and secondly to a demand for repayment of funds provided by the Austrian Cooperation for Development due to FENACOOP’s failure to submit complete documentation. 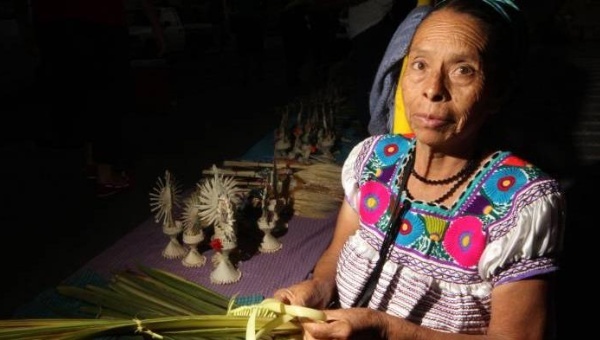 In the jungles and mountains of the Mexican southeast 46,000 indigenous families are resisting the most prolonged counterinsurgency war in the recent history of Mexico. They are grandparents, men and women, youths, girls and boys of four generations of those that a half century ago were abandoning the path and long walk of resistance per se to construct another, the Resistance for its own sake… The task was not simple… In the Chiapas of the Indians, war has been systematic, practically permanent. We can place one part of the War against the People in Mexico a half-century ago. The workers and teachers experienced it in 1958. As students, we experienced brutal repression of the Student Movement in the Plaza of the Three Cultures in 1968. The CIA, the federal government and their armed forces were the intellectual and material actors of the massacre. In the 1970s, the federal government and the armed forces created the Halcones (Falcons) paramilitary group that was present near the Mexico City International Airport the day that a group of exiled Mexicans returned from Chile. They attacked us on two occasions: the first near the Casco de Santo Tomás, and the second in San Cosme, where they murdered dozens of students on June 10, 1971. Those State crimes encouraged and gave way to a growing number of movements and armed groups in Mexico. In the mountains of Guerrero, Lucio Cabañas commanded the armed forces of the Party of the Poor. On August 6, 1969, on 5 de Mayo Street in Monterrey, N.L., a group of 7 persons founded the National Liberation Forces (FLN, their initials in Spanish), three more witnessed the act. The Cuban Revolution, the guerrillas and the figure of Che, the National Liberation Movements in Asia, Africa and in Latin America and the revolutionary wars in Central America were the referents that spirited the armed struggle in Mexico. The United States and the USSR were bottled up in World War III, the Chinese communists were confronted with the Russians, and the Yankees were headed to the defeat in Vietnam. To guard its backyard patio, the US imposed the dictatorships, gorilla governments in Latin America. Within that context, the government of Luis Echeverría Álvarez (LEA) adopted the Counterinsurgent War Strategy in which were conjured up, alternatively, the Dirty War (military and paramilitary violence), the Democratic Opening and the programmes derived from the Social Policy. LEA’s international policy was characterized by the defence of the Sovereignty of Nations, Self-determination of the Peoples and political asylum to the persecuted from the military dictatorships. In that way, LEA projected a democratic, humanitarian and Third World image. With the Dirty War, the federal government and its armed forces disarticulated and/or annihilated the main body of the armed movements, urban and rural, in Mexico. The result of the Dirty War was 10,000 disappeared persons. In Chiapas, the federal government militarized and populated the jungle and the border with Guatemala with Indians, and started the construction of the Border Highway. With those measures, LEA’s government constructed El Yunque for containing the Guatemalan guerrillas. Within that context of war, the National Liberation Forces (FLN, their initials in Spanish) were discovered on February 13, 1974. 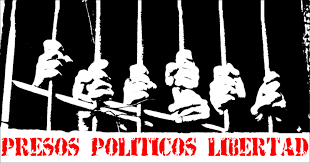 The police were looking for guerrillas of the Liga Comunista 23 de Septiembre (September 23 Communist League) who had murdered the impresario Eugenio Garza Sada one year before. That operation led them to an FLN safe house in Monterrey. They arrested and tortured two of its members. On February 14, the Mexican Army attacked the headquarters in Nepantla. Five combatants died there and two were detained. The soldiers found data in the Nepantla house about the foco established in Rancho El Chilar in the municipio of Ocosingo, Chiapas. Later, 3,000 federal Army members carried out Operation Diamante. 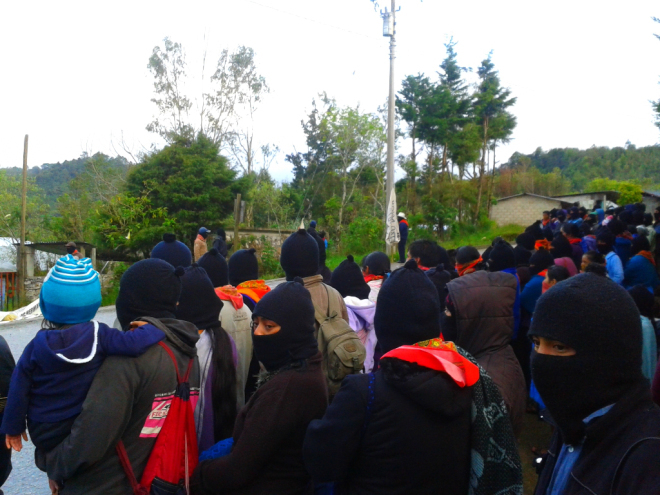 Between February and March they extended a circle to locate, occupy and destroy the camp of the FLN’s first Emiliano Zapata guerrilla nucleus in Ocosingo, Chiapas. Seven combatants were murdered and disappeared: Elisa Irina Sáenz, Raúl Pérez Gasque, Carlos Vives, Juan Guichard Gutiérrez, Federico Carballo Subiaur, César Germán Yáñez and Fidelino Velázquez. After a very complicated decade, the FLN was in the position to found the second guerrilla nucleus in the Lacandón Jungle. Meanwhile, the Programmes to Combat Poverty were grouped together with the violent repression against the indigenous and campesino movements in Chiapas in which the PRI governments, the federal Army, the police and the private armies of the ranchers known as Guardias Blancas (White Guards) systematically participated. Here are some cases: 1974, 40 soldiers of the 46th battalion burned 29 huts in the Colonia San Francisco in Altamirano municipality. 1975, Tzotzil leaders of Venustiano Carranza were murdered by pistoleros of the ranchers Augusto Castellanos and Carmen Orantes; 1976, confrontation for several hours between the federal army and comuneros  of Venustiano Carranza. The result was 2 comuneros dead, 3 injured, 13 detained, 6 women raped and several dead soldiers; 1977, the federal Army extended a military circle in Simojovel, Huitiupán and Sabanilla, 16 ejidos were evicted and the schools were converted into barracks; 1978, in Ocosingo, the Army evicted the indigenous residents of Nuevo Momón, destroyed and burned 150 homes, resulting in 2 Tzeltals dead and 6 tortured; 1979, paid gunmen carried out attacks on campesinos of Venustiano Carranza and Villa de las Rosas and murdered 7 campesinos; 1980, encirclement, intimidation and military manoeuvres in charge of 9,000 soldiers in the Tojolabal municipio of Las Margaritas; 1981, 45,000 soldiers effectuated counter-guerrilla manoeuvres and simulations in the Chol region – Tila and Sabanilla -, in the Lacandón Jungle and on the border with Guatemala; 1982, finqueros and police attack the Tzeltals of Flor de Cacao village; 1983, the indigenous caciques of Chalchihuitán organized the massacre of 11 indigenous and the destruction and burning of homes in the village of Tzakiuc’um. In that scenario of Social Policy and a war against the peoples, Bishop Samuel Ruiz and the pastoral agents had opted “for the poor among the poor.” Committed people accompanied their resistance and their walking in the Construction of the Kingdom of God. They did not walk blindly. The 1974 Indigenous Congress had profiled a programme of struggle that would be in effect for the next two decades. A programme that guided their accompaniment and the movement of the peoples: Land, health care, education and housing. 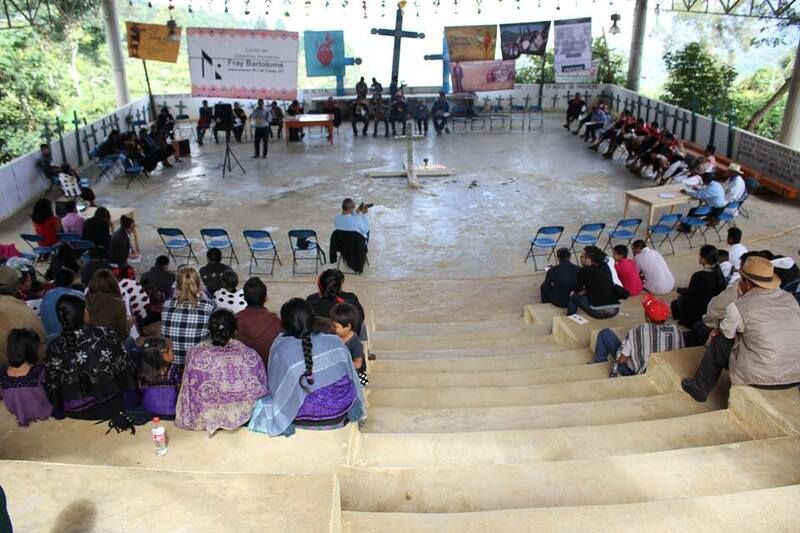 In the midst of the war against the indigenous and non-indigenous peoples of Chiapas, the Diocese of San Cristóbal de Las Casas was found also among the communist, revolutionary, political military social activist organizations that forged the Kiptic ta Lecubtesel, the Independent Central of Workers and Campesinos (CIOAC), the Organización Campesina Emiliano Zapata (OCEZ), the ARIC Union of Unions, Solidaridad Campesina Magisterial (SOCAMA) and the Organización Indígena de Los Altos de Chiapas (ORIACH). On November 17, 1983 the FLN finally established, after five attempts, the Second Emiliano Zapata Guerrilla Nucleus in the Lacandón Jungle. They came with two decades of experience and the teachings that the hard blow of February 1974 had taught them. The jungle, the mountains and the canyons gave them cover. Nevertheless, the social movements were the best cover in the decade for the silent accumulation of forces. With intelligence, they moved under and among the fallen leaves of the social movements, and “they put a trigger to hope.” They had in their favour the triumph of the Sandinista Revolution and the wave of revolutionary wars in Guatemala and El Salvador. The FLN would resolve the challenges that various changes in the juncture imposed within the international ambit and their national and local impact, the differences between the groupings that opted for the mass movement and that of arms and the changes of direction among the pastoral agents and their bishop. At the beginning of the 1980s, the federal government intervened decidedly in the peace processes in Central America: Contadora Group (1983), in the Mexico Accord prior to the de-mobilization of the Guatemalan guerrilla in (1991); in 1992, the El Salvador Peace Accords were signed in the Chapultepec Castle. Those peace processes fell upon the orientation of the San Cristóbal Diocese and fundamentally estranged it from accompanying the rebels who were preparing for war in the jungle and the mountains of Chiapas. The signs of the times had changed. For sure, the withdrawal from the communities was no minor thing. Programmes derived from the Social Policy continued systematically in the state. If with LEA (1970), the PRODESCH was the point of departure for the preventive programmes and for social containment in Chiapas, López Portillo created the General Coordination of the National Plan for Depressed Zones and Marginalized Groups (COPLAMAR) (1976). With Miguel de la Madrid the price of a package of basic products was subsidized (1982); and Carlos Salinas designed the National Solidarity Programme – PRONASOL (1988-1994). While the FLN’s guerrilla nucleus moved like the fish in the water, we have to take into account that the waters were not quiet; they were turbulent. Other cases: 1984, ranchers and state police attacked Indigenous in Simojovel. Eight people were injured. In 1985, 2,000 police, 35 ranchers and police evicted housed peons from the Medellín and La Soledad fincas who were demanding lost wages. In 1986, Judicial police and Enrique Zardain’s bosses burned and levelled for the second time 50 houses in Muc’ulum Bachajón in the municipality of Chilón. In 1987, caciques and police burned the town of La Independencia in the municipality of Ocosingo. 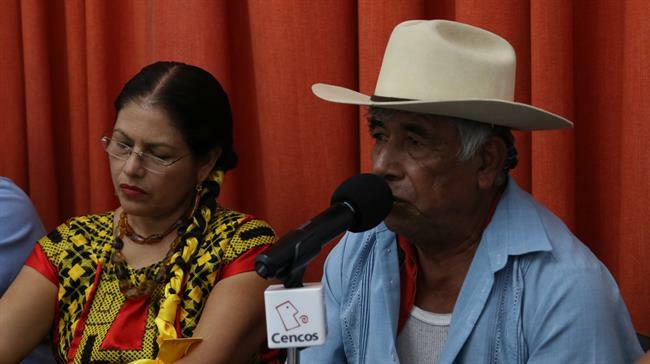 In 1988, the police kidnapped four campesinos from the CIOAC in Las Margaritas. 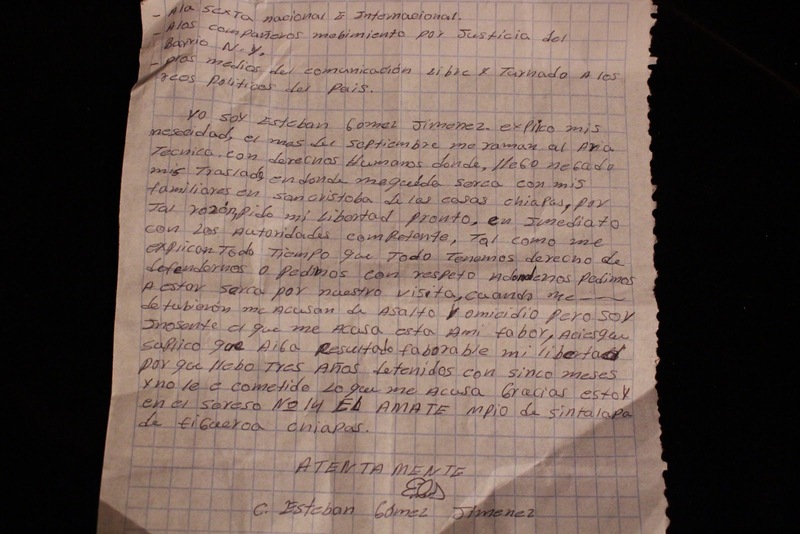 In 1989, the rancher Roberto Zenteno murdered PMS local deputy and former leader of the CIOAC Sebastián Pérez Núñez. In 1989, Arturo Albores, the founder of the OCEZ was murdered. In 1990, the San Cristóbal Diocese denounced that in the absence of Joel Padrón, the parish priest of Simojovel, several unknown persons set fire to the Parish House. In 1991, ten police detained Father Joel Padrón. He was accused of rebellion, robbery, dispossession, conspiracy, carrying illegal weapons, criminal association, an apology for crimes, threats and gang activity… The priest’s arrest was directed at the Bishop. Patrocinio did that. In 1992, Ocosingo cattle ranchers founded the Union for Citizen Defence in order to defend against the “destabilization” that the pastoral agents promoted. In 1993, the commanders of the XXXI Military Zone reported that an Air Force captain and an Army lieutenant were murdered and later burned on lands of San Isidro el Ocotal in the municipality of San Cristóbal de Las Casas. In May of that year, the federal Army discovered a guerrilla training camp and clashed with a group of combatants in the Sierra de Corralchén.